If you were to break into an office building not occupied since the mid-70s, there’s a good chance you’d see tacked to the wall a pine-based receptacle labeled Suggestion Box. This padlocked box would have a slot on top that allowed for the insertion of small slips of paper—each one containing a hastily scribbled note complaining about Fred in Accounting. The physical suggestion box has largely disappeared, but there’s no reason for its functionality to, particularly if you’re willing to spend a little time with Automator. 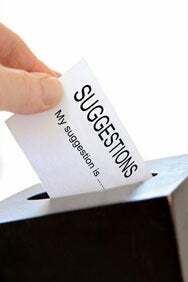 In the following few paragraphs I’ll show you how to construct and automate a virtual suggestion box so you can get employee feedback. These instructions work in both OS X 10.7 (Lion) and OS X 10.8 (Mountain Lion). When they have a suggestion to share, they can fire up TextEdit, make as many disparaging remarks about Fred as they like, and drop the saved TextEdit file into the Suggestion Box folder. It will be copied to the host folder on your Mac. Now that their work is done, you can get to yours. Launch Automator and in the workflow template that appears, choose Calendar Alarm (iCal Alarm, if you're using Lion), and click Choose. In the library pane to the far left of the workflow, select Files & Folders and drag the Get Specified Finder Items action into the workflow area. Then add these actions below—Get Folder Contents (Files & Folders library), Combine Text Files (Text library), New TextEdit Document (Text library), Get Specified Finder Items (Files & Folders), Get Folder Contents (Files & Folders), and Move Finder Items (Files & Folders). 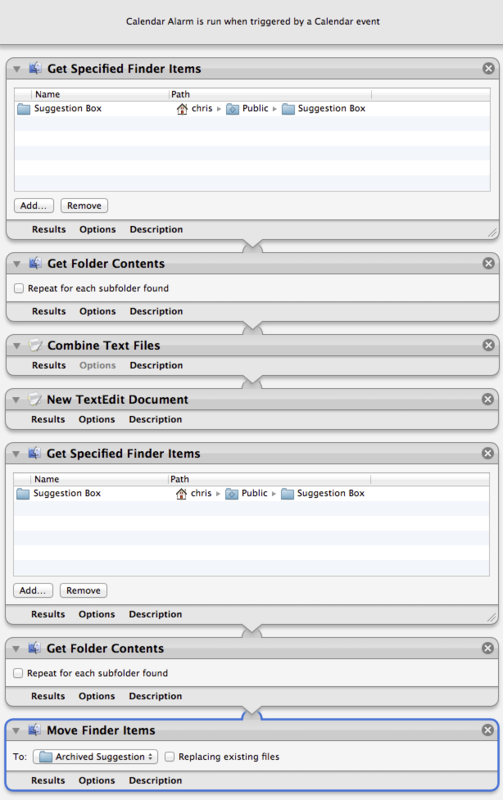 Into the first action (Get Specified Finder Items) drag your Suggestion Box folder. Do the same thing with the next instance of Get Specified Finder Items. To accomodate the last action—Move Finder Items—create a folder on the desktop and call it Archived Suggestions. Drag this folder on top of the To menu in the Move Finder Items action. Save your workflow and, when prompted, enter a name such as Suggestion Box for it and click on the Save button. Calendar (or iCal, if you’re running Lion) will open and a new Automator calendar will be created (if one doesn’t already exist). If you run into the bug where the calendar alarm workflow turns into a regular workflow, choose File -> Convert To, and save a copy as a calendar alarm. Your Suggestion Box workflow will appear as a calendar event. Select it, press Command-E to edit it, and change its start time to 5 PM. Click on Repeat, in the Frequency window that appears, choose Every Week, and move the event to a convenient day—Friday, for example. (If you’d like to see suggestions each work day select Custom, click on the Monday through Friday buttons, and click OK. So, what have we done? At 5 PM on each Friday our workflow looks in the Suggestion Box folder for any text files it finds. 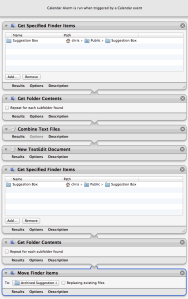 It then launches TextEdit and combines those text files into a single document that you can then peruse at your leisure. Having created the file with the combined suggestions, it moves the original text files into the Archived Suggestions folder. Of course you needn’t use this workflow strictly for a suggestion box. It’s an easy way to effortlessly combine any text files and bring them to your attention, whether or not they beef about Fred.